Learn more about dinosaurs at Conservapedia. Pre-Noachian man tried to tame the dinosaur, wishing to use its might for evilness and arrogantly thinking himself as mighty as the Lord. This grieved the Lord, and He brought the Flood upon the earth [Gen. 6]. Species of dinosaurs were among the animals taken aboard the ark by Noah ( "And of every living thing of all flesh, two of every sort shalt thou bring into the ark, to keep them alive with thee" [Gen. 6:19],) and thus dinosaurs survived the Flood. Scholars theorize that some of these descendents of Noah's ark were used to aid Noah's progeny in building the Tower of Babel. 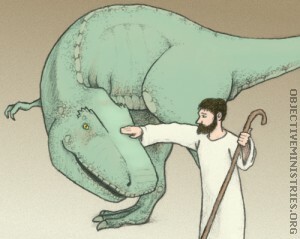 After that fiasco, the Lord felt that man was clearly not worthy of associating with His most powerful creation anymore, and ever since dinosaurs have been hidden from us. Dinosaurs have been a favorite propaganda tool for evolutionists since the 19th century, and continue to be used to promote the pseudoscientific religion of Evolutionism in the Secular media. Movies such as Jurassic Park and Disney's Dinosaur are designed to indoctrinate the masses into the Evolutionistic world view. The appeal of dinosaurs to kids is of particular interest to Evolutionists since it allows them to gain easy and willing access the minds of our children ( "for the imagination of man's heart is evil from his youth" [Gen. 8:21].) And by recasting the Lord's gentle behemoths as blood-thirsty "terrible thunder lizards," they are able to make appeals to -- and further support -- the base desires of our culture for violence ( "Yea, in heart ye work wickedness; ye weigh the violence of your hands in the earth." [Ps. 58:2]). Dinosaur Mania And Our Children - "Dinosaurs are the newest fad. Will they lead children away from our Creator? Or to Him?" In the Book of Job, the Lord clearly describes dinosaurs (called "behemoths" by Adam, in the original Hebrew, and in the 1611 King James translation of the Bible; the term "dinosaur" having only been coined in the 1800's) by saying that [the behemoth] "moveth his tail like a cedar" [Job 40:17]. The Lord also states in no uncertain terms that the behemoths and man lived concurrently when He says to Job "Behold now behemoth, which I made with thee;" [Job 40:15]. This also indicates that Job was able to view dinosaurs for himself. Many instances of overlapping human/dinosaur fossil tracks (footprints in mud that have become hardened into stone) have been found world wide. Some of the more famous are the Paluxy "Man Tracks" of Glen Rose, Texas and the "Tango Lagarto" of Patagonia. Also, evidence of human artifacts found with dinosaur bone fossils are surprisingly common -- surprising mainly since you never hear about them in Evolutionist literature. One typical case was the discovery of copper jewelry in the fossilized remains of the gizzard of a protoceratops found in the Gobi desert. Although exceedingly rare, living dinosaur and related species can still be found world wide. Some famous examples are the Loch Ness Monster, a Scottish plesiosaur (or leviathan); Mokele-Mbembe, an African sauropod; and the Chupacabra, a South American velociraptor. This obviously proves that man and dinosaur have existed -- and continue to exist -- contemporaneously. NEW! (12/1/2002) Read all about Dinosaur Expedition 2002, a joint expedition of Fellowship University, The Creation Science Museum of Cleveland, and the Fairlight Institute which I participated in that uncovered startling evidence of extant Apatosaur in Africa. "And to every beast of the earth, and to every fowl of the air, and to every thing that creepeth upon the earth, wherein there is life, I have given every green herb for meat: and it was so." Before the Fall, there was no death nor bloodshed; it was only after Sin entered the world that animals started to die and to kill. Pre-Fall dinosaurs such as T-rex or velociraptors ate only vegetation, later developing, through the process of Entropic Genetic Degeneration (aka "microevolution,") sharper teeth and a hunger for blood. The reason there are no fossil examples of herbivorous T-rex with teeth more suited to shredding plants than flesh is because all those fossils we have came from the Great Deluge. The bones of herbivorous T-rex newly evicted from the Garden of Eden turned to dust long before the Flood came, and those that perished and were fossilized in the Flood had already succumbed to the wickedness of carnivorism. "And of every living thing of all flesh, two of every sort shalt thou bring into the ark, to keep them alive with thee; they shall be male and female." However, this ignores the possibility that only herbivorous representatives of the dinosaur (and other) kinds were taken into the Ark. It would be unsurprising if Noah, who was chosen over the other wicked men for his unique righteousness, would see fit to choose those individual animals that were themselves righteous, leaving the wicked, carnivorous ones behind to perish. Strong evidence for this hypothesis is the fact that Noah and the other animals weren't eaten, or else we all wouldn't be here today. Another protest is that the dinosaurs were too large to fit in the Ark. This is, of course, rubbish. We know the Ark was sufficiently large to hold all the kinds just fine since God gave Noah the dimensions. We must keep things in perspective: the size of sauropods, wooly mammoths, giant ground sloths, and the like were exceptional; it is the average size of the animal kinds that mattered, and the average was about the size of a house cat. Surely one could fit a great many pairs of house cats into a 300 by 50 by 30 cubit boat with room enough to spare for hay and water! One last Ark-related protest that, amazingly, I keep hearing (it truly boggles my mind how Evolutionism has made people this confused about Creation Science): "How could the T-rex be both on the Ark and fossilized in the Flood?" If you haven't already figured this out by now, the simple answer is that only two T-rex were taken on the Ark from a much larger pre-Flood population of T-rex. The wicked ones left behind were the ones fossilized. While there undoubtedly are some "dinosaurs" named by Evolutionists that are nothing more than overgrown lizards -- the dimetrodon, for example -- the study of Flood remains, baraminological research1, Biblical hermeneutics, and the existence of extant dinosaurs under present environmental and eschatological conditions all support the reality of the special and seperate creation of dinosaur and lizard kinds. So... yes Virginia, there really were dinosaurs, and they were some of the Lord's most magnificent creations -- from the mighty behemoths (apatosaur and its ilk) to the awe-inspiring unicorn (the progenitor of the ceratopsian baramin2). Although Evolutionists have tried to latch on to them and use them as propaganda tools, we shouldn't fall into the mistake of overreacting in our refutations of Evolutionism by denying dinosaur existence or diminishing them as mere lizards. « For more on lizard/dinosaur apobaraminism, see: Losos, J. B, M. Leal, R. E. Glor, K. de Queiroz, P. E. Hertz, L. Rodríguez Schettino, A. Chamizo Lara, T. R. Jackman, and A. Larson (2003). Niche lability in the evolution of a Caribbean lizard community: evidence for Anoles as a single original Type. Baraminology 424:542-545. « See the section on unicorns in Genesis Park's "Dinosaurs in the Bible" article. Also see RAE Video 219: "The Biblical Reem: Possibly a Triceratops?" Doug Sharp, Rich Geer, John Goertzen.